WHY BREEDS FAIL - the need for a new kind of breed club - and breeder! For some enthusiasts the breed of a dog is more important than the dog itself. By this I mean that for them, it is more important for the dog to faithfully conform to their concept of their breed than to be sound, healthy and lead a long life. When I talk to say exhibitors of Mastiffs, Bulldogs, Basset Hounds, St Bernards, Clumber Spaniels, Bloodhounds and Fox Terriers, there are times when I hardly know whether to laugh or cry! And when at Crufts, a Bloodhound exhibitor solemnly told me that the reason for excessive, loose-skinned head-wrinkle in his breed was to ensure that the hound when head-down, pursuing a scent, couldn't be distracted by sight - I did, I'm afraid laugh out loud! The previous week by chance I had been at a Game Fair where two packs of Bloodhound were paraded - with no sign of excessive head-wrinkle on any hound. 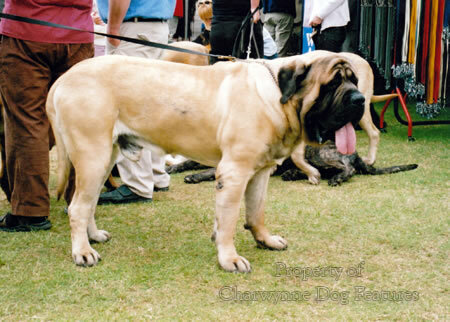 Incensed by seeing deformed Mastiffs in show rings, even at World Dog Shows, I went away and wrote The Mastiffs - The Big Game Hunters to set out the history of this remarkable type of dog as a heavy hound, accent on the hound. Over a decade, this book went to six editions and is still in demand, a force for good I do hope. Breeds such as this one can be destroyed by those who claim to love them! But has breed-identity prevailed over soundness in some breeds? The parties to the European Convention for the Protection of Pet Animals evidently think so. Their resolution on the breeding of pet animals, adopted by multilateral consultation ten years ago names guilty breeds. 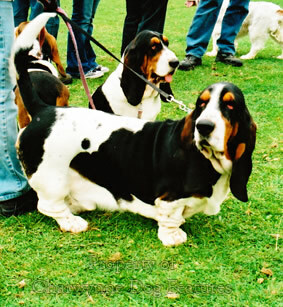 They aim to: set maximum and minimum values for height and weight in very large and very small breeds, set maximum values for the proportion between length and height of short-legged dogs (Basset Hounds and Dachshunds) to avoid disorders of the vertebral column, and set limits to exaggerations. The latter include: shortness of the skull, so that breathing difficulties are avoided (citing the Bulldog, Japanese Chin, King Charles Spaniel, Pug and Pekingese), abnormal positions of legs (straight stifles in Chows, Buhunds, Lapphunds), (bowed legs in Basset Hounds, Shih Tzu, Pekingese), very long ears (Cocker Spaniel, Bloodhound, Basset Hound), and markedly folded skin (Bulldog, Basset Hound, Shar Pei, Pug and Pekingese). What a commentary on pure breeding! It also seeks to set limits to abnormal size and form of eyes or eyelids (St Bernard, Basset Hound, Bloodhound) and small deep-lying eyes (citing four terrier breeds, Chows, Newfoundlands, etc. ), as well as large protruding eyes (Boston Terrier, Cavalier KC Spaniel, Dandie Dinmont, Brussels Griffon, etc.). We supply the largest number of breeds in this list of any country. To concerns about discomfort resulting from exaggerations could be added excessive coat; a number of our breeds, never originally heavy-coated, now increasingly feature too heavy a coat for the dog's good, and quite needlessly. But it's all in the name of the breed, I hear. What that usually means is: it's all in the name of show ring success; if they don't look like that, they don't win. This is no comfort to the dog or most pet owners coping with a discomforted dog. Who is protecting these pet owners? Who is protecting the breeds of dog being listed in this way? 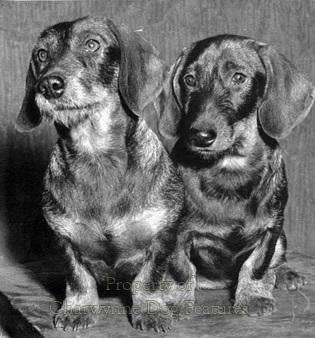 Breed points (very long ears, very short muzzles, sunken or prominent eyes) can exaggerate themselves as gene dominance exerts itself. This is why judging to the breed standard is so important. Breed points can be exaggerated by breeders to produce a 'kennel signature' and make a mark in their breed. Breed points can be rewarded by sycophantic judges anxious for their next appointment. But it is an inescapable fact that exaggeration can be harmful to the dog. It shouldn't need a watchful European body to tell us that some breeds are being bred to a harmful design, but it is commendable that our KC is responding to this convention although the UK has yet to sign up to it. If breed identity relies on the exaggeration of some features to the distress of the dog, then there is something seriously wrong with that breed. Every breed should look like itself - not a caricature of itself. Some breeds will undoubtedly disappear unless a group of determined fanciers come together and take charge. But do kennel clubs not have a role in this, especially where native breeds are concerned? The German Short-haired Pointer is a common sight at shows and in the field nowadays in Britain. But when working in Germany I have always been more impressed by the Langhaar and the Stichelhaar than the Kurzhaar. This was also true of the Small Munsterlander, which always impressed me more than the larger variety, but has never attracted British interest. Promoting a particular breed has often had a 'hit or miss' element to it. Human fickleness can destroy a breed. Unwise or hasty patronage can come from those craving the exotic. Some distinctive breeds fail to attract interest outside their own territory, remoteness denying exposure. Desmond Morris covered 1000 breeds in his Dogs of 2001. But he can be forgiven for missing the hairy-footed donkey-herding dog from the thinly-populated Hoxe valley on the Syrian-Turkish border, between Gaziantap and Halab. Believed to spring from drovers' dogs left behind by the Crusaders, DNA sampling has revealed a kinship with the Saarbrucken Schnauzer and the Bouvier de Thionville. The hairy feet are believed to have developed from the need to protect the dogs' feet from the gaultheria bushes that are rampant in the area, attracting wild donkey herds. Pups of this extremely rare breed are now selling for £2,500 through the internet. A club has been formed to conserve this distinctive breed and FCI recognition is awaited. But hold on, none of this is true, I made it up! No such breed exists. (When I wrote this falsehood - with a clear statement, as here, stating it be invented - in a national dog magazine, a reader actually wrote in asking for details of how to obtain one!) Yet how easy it would be to design a false provenance for some obscure type found in some obscure place. Look at some of the KC-agreed breed histories if you doubt the credibility of my words! 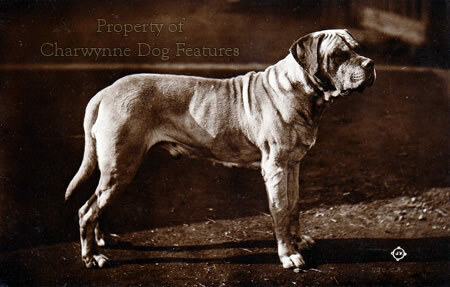 Comparable inventiveness has been responsible for the creation of some actual breeds. Is the Magyar Agar really a separate breed from our Greyhound? Does the ear carriage difference between the Norwich and Norfolk Terriers justify their distinct classification as separate breeds? Is the small version of the Portuguese Podengo really a breed or overdue recognition of a village cur? In South Africa some of the tribal hunting dogs have conformed to a distinct type for centuries but so far no one has claimed breed status for them. 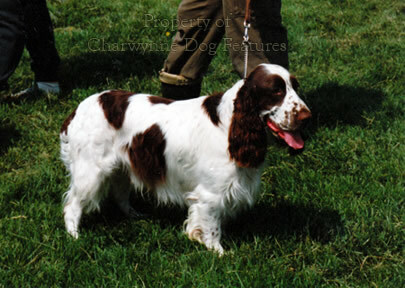 The European hawking dog is probably the root of our setter breeds and the epagneul breeds, like the Brittany. But no one ever claimed breed status for it. 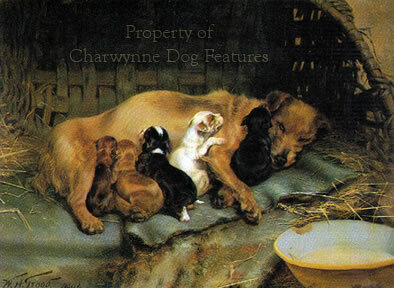 Time and time again, in books on specific contemporary breeds, the writers claim that in such and such a painting 'their' breed is depicted. Such silliness does little for breed authentication. And why does there have to be speculation over whether a dog rescued by Britsh forces in Afghanistan is a Maremma or a Kangal Dog? Why can't it be an Afghan breed-type for which breed status has never been sought? Why think breed first, dog second? Our own Victorian writers found difficulty in not regarding foreign breeds as having a quite separate development from ours. They even copied each other in debating whether our ancient water-dog, the Curly-coated Retriever, was a Poodle-Whiptail cross, and had little chance of understanding the origin of overseas breeds against that sort of ill-informed reasoning. And, to be fair to them, it is easy to think of the Irish Wheaten Terrier when you first see a Smoushond or an Irish Setter when you first see a Langhaar. But such similarities should serve to remind us that breeds developed from functions. Function often decided the type of coat, the stature, the head shape, the length of leg and therefore the appearance of the dog. The worry is that in the exhibition of breeds, we concentrate on breed differences and end up exaggerating the coat-length, the shoulder height, the shortness of the muzzle, the length of the ears and the importance of coat colour. All too soon such identified features become components of essential breed type and the function of the breed overlooked. This is never good for a breed. In the past, function always dictated form, to the benefit of the dog; I doubt if show-ring fashion will ever benefit a breed. Every week the dog papers print critiques of judges from dog shows in which the quality of movement is deplored, the shortness of the upper arm decried, the uprightness of the shoulders condemned and the lack of hard condition regretted. This is not good news for purebred dogs. Purity of breeding was always expected to improve dogs not destroy breeds. I do not know of one breed which still earns its keep in the field and which displays the exaggerations of show ring dogs. The 'Teckels' I watched working in Germany did not feature the elongated backs, abbreviated legs and weak feet of their British show ring counterparts. The snipey muzzles, short backs and upright shoulders of so many show Fox Terriers are not matched in hunt terriers. 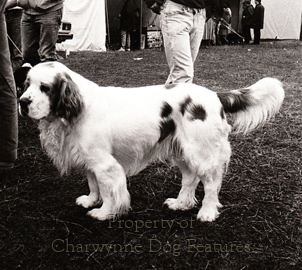 Springers at trials do not feature the heavy coats favoured in the show ring. 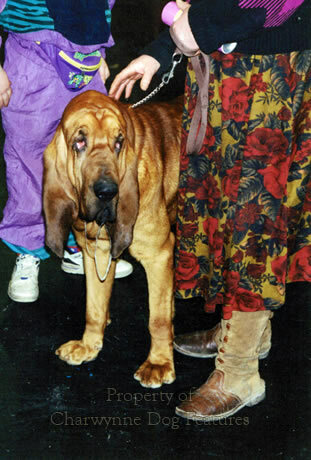 Bloodhounds of the packs do not display the ear length and looseness of coat of all too many show Bloodhounds. There should be no confusion here; what does a breed need in order to function? That should be the key question. Function gave us the breeds; ignoring it will take them away. In the wake of disasters such as the foot and mouth crisis and in a future which threatens the sporting dog, we could end up one day with sporting and pastoral breeds that lose their functional physique and eventually their breed type too. The show ring already condones exaggerations that are not only alien to a breed but a threat to its well-being, but the KC really must be more assertive. There is a great need for vigilance in some breeds now. In the coming years every breed developed for a purpose will develop differently if that purpose is lost sight of. 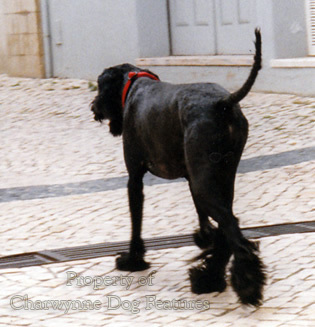 Showy high-stepping or alternatively, short-stepping dogs, with ears on the ground and untypically heavy coats never featured in the breeds passed on to us by our ancestors. Recognition of a breed should bring uniformity of type, the chance of better-bred dogs and access to shared expertise. But sadly all too often it brings a closed gene pool, closed minds in breeders and quite needless decline. For any kennel club, home or abroad, to see itself as having a role in the improvement of breeds and then sit on its hands and do nothing when breeds are bred unwisely is contradictory. But when was the last time in any country when the national kennel club spoke up on a breed issue out of concern for that breed? It would be good to be informed of such an instance. Our KC talks about its collective concern but never steps forward far enough or strongly enough. At a time when breed-specific anti-dog legislation is being rightly ridiculed and now campaigned against by the KC (who helped draft the Bill), it is important to recall their role when the dreaded Dangerous Dogs Act of 1991 was being drafted. It was our KC which advised the Home Office on which breeds should be proscribed here. Commendably they have changed their stance. But if they hadn't advised the Home Office as they did thirteen years ago we would not have had breed-specific legislation here at all. And would that not have influenced our European neighbours? Against that background, how can we trust such a body to safeguard the future of our precious breeds? It would be unwise and unrealistic however to expect kennel clubs to assume the mantle of breed-protector alone. What are breed clubs for? Most breed clubs would be better named Exhibition Society for that breed, for that seems to preoccupy them. A breed club should have a strong ethical role; the first items on any breed club committee's agenda should be: Breed Health; Breed Rescue; Breed Improvement; three items surely much more challenging, and rewarding, than Judging Appointments; Cups and Trophies and Show Programme. A position with authority means a position with responsibility. But who really is responsible for our precious breeds at the moment? Why are Breed Clubs not doing their job? Unless there is some leadership in saving threatened breeds, guarding true breed type, enhancing breed health and working towards the betterment of the breed, the outlook is gloomy. A combination of eroded breed type, harmful design, poor genetic health and a lack of sound physique is going to undermine a number of breeds; it is never too late to stop and rethink any issue. Surely this one is worthy of our time. British breeds of dog are admired the world over but there is work to be if that wholly desirable situation is to continue. Breeders and Breed Clubs have work to do! And the KC too. Is it wise for our breed lists to be cast in tablets of stone? Are the gene pools of the accepted pedigree breeds not capable of improvement? 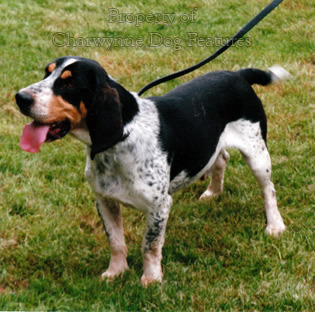 The hunting Basset Hound people have much more open minds - their outcross to the Harrier has resulted in a far healthier hound. Are we breeding dogs for their written pedigree or their health and well-being? I wonder what the great gundog breeder Korthals would make of today's closed gene pools; he crossbred until he produced a pointing griffon of remarkable prowess. My personal views on breeding one breed of dog with a different one are quite clear: if a pedigree breed is retaining type and temperament, virility and vigour, then there is simply no need to introduce outside blood. But if say the Field Spaniel could gain considerably from an infusion of Springer blood, as happened some years ago, then I would support it. An enlightened Breed Club once did! It is perfectly understandable, of course, for those favouring one particular breed to want to safeguard that breed, protect it from 'mongrelisation' and strive to prevent misuse of that breed by unsavoury people. But if that breed has serious inheritable defects or inbred faults difficult to breed out then an outcross to better blood makes a great deal of sense. 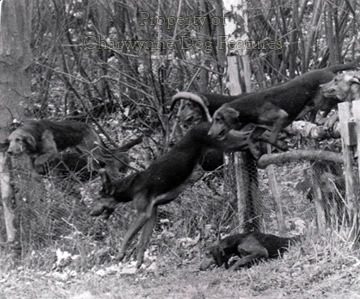 The show Bloodhound would undoubtedly benefit from such a course - just as the renowned Bloodhound breeder Brough advocated in each fifth generation. The soundest healthiest Clumber Spaniel I have ever seen came from a Clumber-Springer cross; surely the health of our dogs comes before pedigree. If pedigree stock owners in the past had refused a mating to a different breed, then the Irish Wolfhound would never have been re-created, the Mastiff would be a very different breed today and the Bullmastiff simply wouldn't exist! I ask purebred dog breeders two key questions: What collective action is being taken to breed out inherited diseases in their breed? And two, what breeding programmes are being promoted to counter the appalling movement so prevalent in the breed or to correct undesirable temperament whenever it crops up in the breed. Surely any breed fancier worried about the future of their breed would be addressing such problems ahead of all others. Breed Clubs should protect type and health in their chosen breed. The twentieth century will be remembered in the world of dogs as a century in which we stopped thinking and blindly perpetuated pedigree stock 'warts and all'. I do hope it doesn't take shock TV programmes or the welfare legislators to bring us back to common sense and genuine care for subject creatures. It is immoral to breed from inferior stock just because it is pure-bred. It makes no sense at all to expect tiny gene pools in so many breeds to go on producing high quality dogs. The guide dogs for the blind people are crossing the retriever breeds to produce a more suitable dog for their requirements. Our ancestors, who produced the splendid breeds of dog which we now enjoy, would admire such an activity. They sought good dogs ahead of good pedigrees. There is a difference! But all this is still too radical for the pedigree dog breeder of today; it is the time of the conformist not the individual who is not afraid to stand alone. Time for a rethink on Breed Clubs. Time for a new breed - of breeders!